If UPSC surprised many aspirants in Prelims 2014 General Studies Paper 1 with the inclusion of some trivial and peripheral questions, the surprise element in General Studies Paper 2 (CSAT) was because of its higher standard and deviation from previous patterns. It was a deviation from the pattern set by UPSC from 2011 to 2013 due to the absence of decision making questions and the ‘vacuum-filling’ by numerical ability (maths) questions. Cancellation of English Language Comprehension by UPSC following the Government decision totally changed the paper structure, but most candidates still struggled to finish the CSAT paper in spite of less number of questions to be attempted. ClearIAS.com has already published detailed answer keys of Prelims 2014 Paper 1 and Paper 2 (CSAT). We have also hosted All India Polls to get a better idea about the exam difficulty and expected cut-off score. 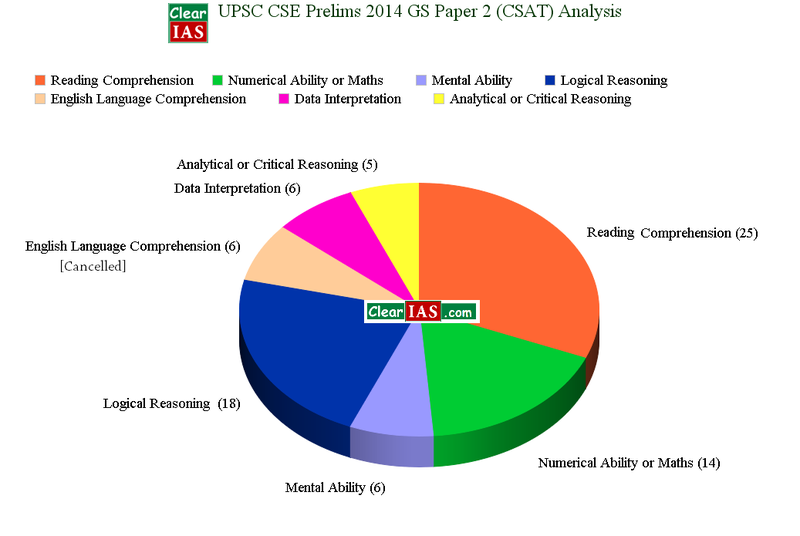 This post is a detailed analysis of UPSC Civil Service Prelims 2014 GS Paper 2 (CSAT paper 2). Those who missed our analysis of Prelims 2014 GS Paper 1 can access the same by following the hyperlink. PS: The question split can vary on the basis of how you treat interdisciplinary questions. Difficulty level of questions: UPSC Civil Service Prelims 2014 Paper 2 was of higher difficulty level than CSAT papers from 2011 to 2013. Removal of comparatively easy sections like decision making and English language comprehension made very high scores almost impossible. In 2011 these two sections together had 16 questions (40 marks). Lengthier passages: The total number of passages (8) remained the same as in 2013. But the passages were tougher and lengthier (often extending to one full page, and questions overleaf) when compared to previous years. Number of reading comprehension questions: The total number of reading comprehension (RC) questions with Hindi translations were 25. At-least 5 of these RC questions were really tough, thanks to the close/ ambiguous choices. PS: 6 RC questions without Hindi translations were cancelled after the CSAT row. More numerical ability questions: Apart from 2012 (where the number of questions from maths were less than 3) in all other CSAT Prelims, the number of maths questions remained more or less constant at around 10. This year, the number of numerical ability questions were 14. New type of critical reasoning questions: Statement-Assumption or Statement Conclusion type reasoning questions were not seen in CSAT Prelims till 2014. These types of analytical/critical reasoning questions are common in other exams like GMAT. So future aspirants are advised not to limit their preparation to usual pattern of questions by UPSC. UPSC can any day expand their horizon. 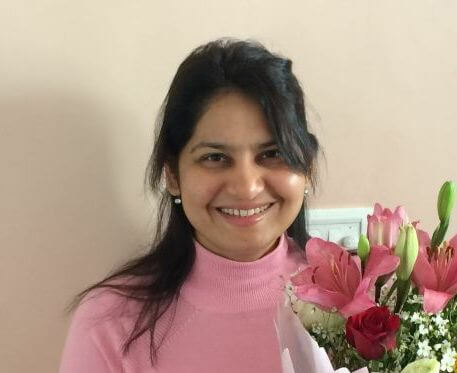 Time wasted in searching Decision Making: The absence of Decision Making questions in 2014 CSAT paper, shattered the mental calculations of many candidates who had planned to start with that section. Unfortunately as 1 or 2 question can decide the fate of the aspirants with respect ot Prelims, each of these lost minute counts. Confusion with regard to English Language Comprehension: The last minute changes made by UPSC/Government regarding cancellation of English Language Comprehension created confusion among some aspirants, who were not aware of this change. Though instruction were pasted on Exam halls, and announcements were made, the confusion factor was still there. 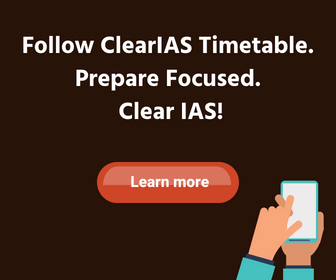 PS: As soon as DoPT issued the rules, ClearIAS.com too had tried our best to create awareness among maximum candidates by sharing the information about the change in exam pattern through our website as well as Facebook page. Good number of attempts in CSAT: Average attempts ranged from 50-70 questions (of-course, there are candidates who attempted well above and below!) But number of attempts does not seem to make huge difference in this paper as the paper was tough. With lesser attempts but more accuracy or higher attempts with low accuracy, what counts finally in CSAT is the total score! What is a good score in Prelims 2014 Paper 2 (CSAT)? Analyzing the difficulty level of paper, feedback from aspirants, and response from the Clear IAS All India After Prelims Cut-Off Poll, here is our response : 115-125 = Good Score; 125-135 = Excellent; 135+ = Exceptional. Even those with less than 115 too can hope of clearing Prelims if they have done well in General Studies Paper 1.
which type of logical and reasoning questions asked the csat?